Buick’s Encore combines the affordable subcompact crossover with quality and refinement more befitting of the premium segment. Two 1.4-liter turbocharged four-cylinders are available, kicking off at 138hp, with the more powerful one offering 153 hp. 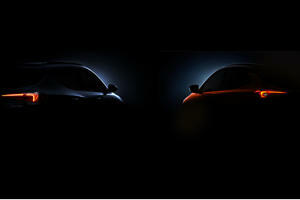 Both engines are mated to a 6-speed automatic gearbox, though buyers have a choice between front- and all-wheel drive. Standard equipment is generous and includes touchscreen infotainment, noise cancellation software, and split folding rear seats. Priced between $22,990 and $32,100, the Encore rivals the Hyundai Kona, Nissan Kicks, Toyota C-HR, and Mazda CX-3, amongst others in an ever-growing vehicle category, presenting a strong case with high levels of refinement and competence in the segment. The subcompact crossover segment is booming, with every major brand presenting at least one offering to tempt buyers with. Buick’s in on the party too, with the premium brand offering the Chevrolet Trax-based Encore. But unlike the Trax, the Encore moves upmarket, and offers an impressive list of equipment and safety features to tempt buyers that might be looking at offerings from other premium monikers. Priced from $22,900, a 1.4-liter turbocharged engine offers two different states of tune, along with six different trims to provide numerous alternatives to the Mazda CX-3, Hyundai Kona, and on the more expensive side of things, the Mini Countryman. After the design upgrade for 2017, Buick hasn’t upgraded the exterior of the Encore any further. As a result you’ve still got the same shape as last year, along with the double-L shaped LED daytime running lamps up front on the tall façade of the Encore. A sculpted front bumper houses fog lights on the Sport Touring trim, while underbody guards on the front bumper are more visual than functional. The subcompact proportions of the Encore are emphasized in side profile where the 6.22-inch ground clearance gives it the appearance of being short and upright in build. This design is amplified at the rear, where the Encore seems to narrow dramatically from the LED taillights upwards, while the base remains squat in stance with a single chrome tailpipe located on the right hand side of the rear bumper. All models feature an array of black plastic cladding, lending the Encore a chunky, masculine look and hinting at off road performance. 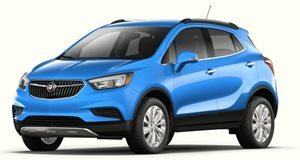 Buick offers 9 exterior color choices for the 2018 Encore; Graphite Gray Metallic, Black Cherry Metallic, Summit White, Coastal Blue Metallic, Ebony Twilight Metallic, Quicksilver Metallic, White Frost Tricoat, Winterberry Red Metallic, and the new for 2018 Coppertino Metallic in place of last year’s River Rock Metallic. Key overall dimensions for the Buick Encore are a length 168.4 inches, a height of 65.2 inches, 6.22 inches ground clearance, a wheelbase of 100.6 inches, and a total width of 69.85 inches. The Buick Encore is powered in all forms by a 1.4-liter turbocharged 4 cylinder engine, available in two states of tune. In its base format, the 1.4-liter features multi-port injection and produces 138 horsepower and 148 lb-ft of torque . The second variation of the engine, available on Sport Touring and higher trims, offers direct injection and ups the power figures to 153 hp and 177 lb-ft. Only one transmission is available regardless of engine, a 6-speed automatic, though buyers have a choice between drivetrains with Buick offering the Encore in either front-wheel drive in all trims or all-wheel drive guise on all trims but the 1SV. The base port-injection motor is underpowered for the weight of the Encore, with pull-off feeling strained and overtaking requiring level ground or immense momentum. The direct injection offering is vastly more point, though still doesn’t endow the Encore with lightning performance. It does however get up and go far quicker off the line and offers superior overtaking ability – even if feeling a little flat whilst doing so. The 153 hp motor isn’t just quicker and more powerful though, as it’s also the more frugal of the two motors on offer. 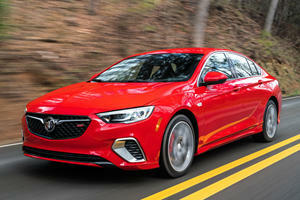 EPA estimates for the 138hp engine are 28 mpg given a good mix of city and highway driving combined in front-wheel drive guise, while the all-wheel drive offering decreases these to 27 mpg. On the Encore’s 14 gallon tank, that’s up to 392 miles per tank. 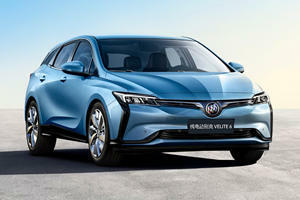 The higher powered offering however has estimates of 30 mpg in front-wheel drive and 29 mpg in all-wheel drive forms, boosting overall range per tank to 420 miles. As to which engine is better, it’s a no-brainer really, and buyers should opt for the direct injection motor offering 153 hp, despite the additional cost. How Big Is It Inside? The Buick Encore is capable of seating 5 occupants, though only 2 adults can sit in the back seats without too much complaint. Front occupants are treated to decent amounts of space with copious amounts of headroom. A high seating position is comfortable on long distance journeys and ensures good forward visibility, while the large windows ensure minimal blind spots to the sides of the Encore – and available blind spot monitoring helps overcome whatever there may be. The driver benefits from 6-way power adjustment with height adjustment on all trims, though on base models the front passenger seat doesn’t offer height adjustment. The rear seats offer ample space and legroom for most adults, with headroom and decent legroom allowing for taller occupants to ride along as well. The rear seats also house 2 full sets of LATCH anchors, though the lower tethers are deep set in the seats and difficult to access. On design and feel, the Buick Encore presents itself as a true luxury crossover, but it’s let down in a couple of key aspects. Some hard plastics on the doors and lower center console, and gloss black trim on the center stack of some models makes the Encore feel very commonplace. However on the whole it’s an impressive interior with many soft-touch appointments to bolster the luxurious impression it gives off. Panels feel solid and well put together and dash rattles are non-existent, while noise insulation is exceptional even at highway speeds. On higher trims, leather upholstery is available to compliment the soft-touch materials elsewhere, though standard kit is cloth and leatherette trim on base models. Single zone climate control keeps things cool by default, though as you travel up the trim ladder you’ll find dual-zone climate control, and features like heated seats and steering wheel. The ergonomics are sound as well, with straightforward controls all easily within reach and tactile knobs for controlling the climate control systems. But the Encore’s design is bearing its age a little, as the wealth of buttons on the dash more than just hints at an era before touchscreens ruled the world. The Encore features a standard 8-inch touchscreen system that borrows from Chevrolet’s MyLink system, though dubbed IntelliLink. It offers Apple CarPlay and Android auto functionality, and a 4G LTE data connection with onboard Wi-Fi. It also features SiriusXM satellite radio, comes stand with 6-speakers, and can accept audio input via auxiliary jack, USB input, or Bluetooth media streaming. Navigation and live traffic updates are optionally available. The Buick Encore offers just 18.8 cubic feet of cargo space behind the rear seats, more than the 12.4 cubes offered by the Mazda CX-3, but less than the 19 cu ft offered by the Hyundai Kona and Toyota C-HR. However, it’s enough room for a week’s worth of groceries, or your golfing equipment for weekend excursions. The rear seats fold in a 60/40 split, though they require more effort than should be necessary, increasing storage volume to 48.3 cubic feet. Adding to the Encore’s practicality further is a fold-flat front passenger seat allowing for even the longest items to be loaded provided you’re travelling on your lonesome. The load hatch is also large, particularly in vertical measurement, though the tall height of the Encore means you need to be careful in low-roofed areas. Though the Buick Encore is one of the oldest subcompact crossovers in segment, it’s still surprisingly good to drive. While many in the segment cut costs on insulation, the Buick offers truly premium insulation from the world outside. Key to this is the suspension that, while soft, is capable of ironing out both large and small bumps in the road surface and provides ample handling ability. On all surfaces, the Encore turns rough road into smooth sailing with impeccable ability to filter out any imperfection thrown its way. It maintains this composure at all speeds, but it’s only when you reach highway speeds that you realize just how composed the Encore is. Even at speed, wind and road noise seem just about non-existent as the Encore cossets you in silence and comfort – largely due to the active noise cancellation equipped to the Encore. Of course, the comfort-bias of the suspension has its ‘failings’, key to which being it’s no hot-hatch in the handling stakes. While it maintains extreme composure, the tall ride of the Encore means there is a fair amount of body lean when cornering. Pair this with a steering setup not exactly oozing feedback, and the Encore is what I’d place firmly in the "not a driver’s car” section of the woods. In fact the steering is kind of dead as well. It steers directly enough, and responds well to inputs, but there’s zero feedback from the front wheels, and when combined with the complete separation from the road due to the impressive insulation, the Buick Encore is devoid of all driver feel and enjoyment, making the Encore the automotive equivalent of a sensory deprivation tank. But while cold, the Buick Encore is supremely comfortable, and functions as it should. It steers when you tell it to, and the brakes work rather well, bringing the Encore to a halt with great efficacy. Of course getting up to speed is another story altogether, and should you opt for the lower output engine, getting up to speed might take you a while. From both standstill and when on the go, it takes a while to find its ‘get up and go’. The direct injection motor somewhat remedies this with quicker acceleration and overtaking ability, but ultimately the Encore is a crossover that enjoys a leisurely stroll rather than an athletic jaunt. The automatic gearbox – the only option available – does a good job of swapping cogs for you, and it manages the torque and boost as well as it could, but it’s not exactly a memorable piece of work. It’s a bit of a bore, the Encore, but what it does do is ensure you reach your destination as relaxed, if not more so, than when you departed. In our excursions with the Buick Encore, not once did it cast any concerns over potential issues with reliability. The base engine has a proven history – used in numerous Buick and Chevrolet products over the years – and the direct injection upgrade continues in the same vein. J.D. Power and Associates backs the reliability up with a predicted reliability rating of 4.5 stars – an outstanding result when the industry average is just 3 stars. Rivals like the Honda HR-V scored 3 stars, while the Mazda CX-3 scored just 2.5, highlighting just how well the Encore did. For added peace of mind, Buick covers the Encore with a 4-year/50,000-mile warranty and 6-year/70,000-mile drivetrain warranty – marginally better than those offered on the Honda HR-V and Mazda CX-3. The 2018 Buick Encore starts with a base MSRP of $22,990 for the base 1SV model in front-wheel drive, with 5 other trims available. The base 1SV and $24,400 Preferred trim are similarly equipped, featuring 18-inch alloy wheels, a rear view camera, SiriusXM Satellite Radio, Apple CarPlay and Android Auto functionality, available 4G LTE Wi-Fi hotspot, a power adjustable driver seat, single zone climate control, and cruise control, while the Preferred gets floor mats and a cargo cover, along with access to optional packages. For $25,600 the Sport Touring model unlocks access to the higher powered 1.4T motor as an option, and also equips fog lights, a rear spoiler, remote start, a 120-volt power supply, and an available Bose 7-speaker sound system, blind spot alert, and dual-zone automatic climate control. Preferred II uses the Sport Touring as a base, but adds dual-zone automatic climate control, an auto-dimming rearview mirror, blind spot monitoring rear cross traffic alert as standard for an MSRP of $26,900. Essence models add LED headlights, leather upholstery, a six-way power passenger seat, heated front seats, heated steering wheel, and driver seat memory functions to the mix for $29,100, while the top specification Premium trim starts at $30,600 and includes front and rear parking sensors, forward collision warning, lane departure warning, automatic wipers, and the Bose 7-speaker audio system. The Buick Experience Package, available on the Preferred II, Essence, and Premium models equips 18-inch chromed alloy wheels, a sunroof, and an 8-inch infotainment system with for $2,390. An additional $1,500 upgrades your chosen trim from front-wheel to all-wheel drive, with the exception of the 1SV that is a front-drive only model, while $895 is all the extra you’ll need for the higher powered engine from Sport Touring trim onwards. The Buick Encore is not a driver’s car, but if it’s supreme comfort and a long list of features you’re looking for, then it’s a superb vehicle. The comfort bias and ability to separate occupants from the goings on outside the cabin give the Encore the unique ability to see you arrive at your destination even more relaxed than when you set off, which lends true credence to the premium badge on its nose. While some trim elements might not exude a truly premium feel the overall feel is one of class and quality, and the added reliability is a bonus. Neither of the two available engines is particularly potent, but the $895 premium for the more powerful engine is worth the extra investment, if not for the extra power, then merely for the extra economy it offers. The Encore might be pricier than some of its rivals, but 6 years into its lifespan it’s proven that it’s still one of the best subcompact crossovers your money can buy. However, if you are price conscious, the Mazda CX-3 is just as comfortable, just as classy, but is on offer for less and could well be a fine alternative.